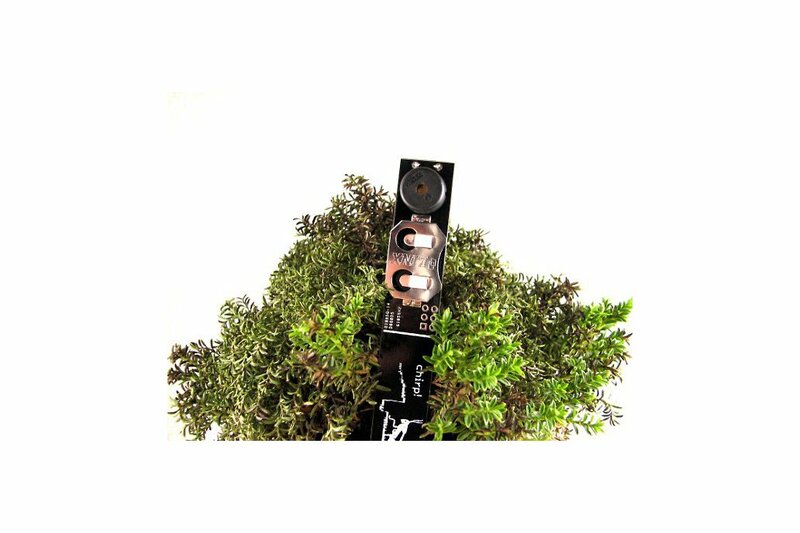 Plant watering alarm - chirps when the soil dries out. Based on capacitive moisture sensing. Chirp is a plant watering alarm - as simple as that. You put it into the soil near a plant and it emits a tiny chirp when the soil is dry, reminding you to water the plant. 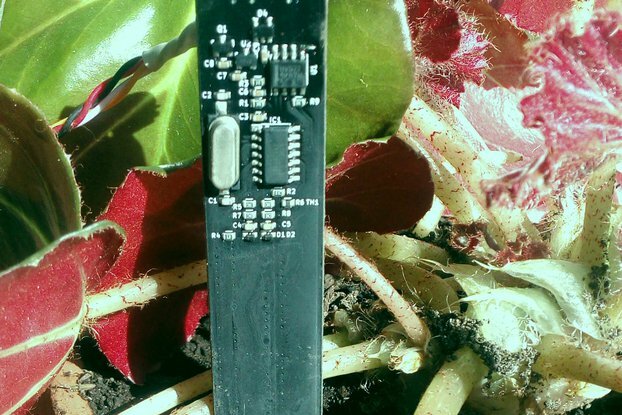 Alternatively, Chirp can work as an I2C soil moisture sensor. If all you need is moisture sensing, consider buying a standalone sensor version. 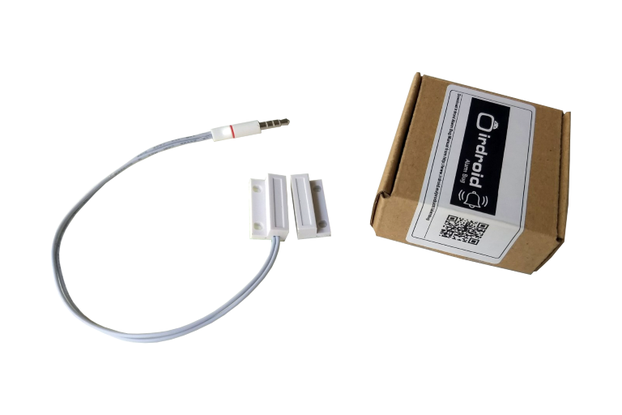 Chirp uses capacitive humidity sensing technique that does not interfere with the soil and does not cause corrosion of electrodes unlike resistive sensing. Chirp is Open Source and totally hackable - you can download and fiddle with the firmware or use it as a standalone moisture sensor. Special care has been taken not to make it yet another source of annoyance - Chirp can detect if it’s day or night by measuring the amount of ambient light and will not make noise at night. The alarm level can be set for each plant individually. As water is consumed by the plant, Chirp will detect the low moisture level and will start to emit rare short chirps. As more water evaporates, Chirp will increase the alarm rate. 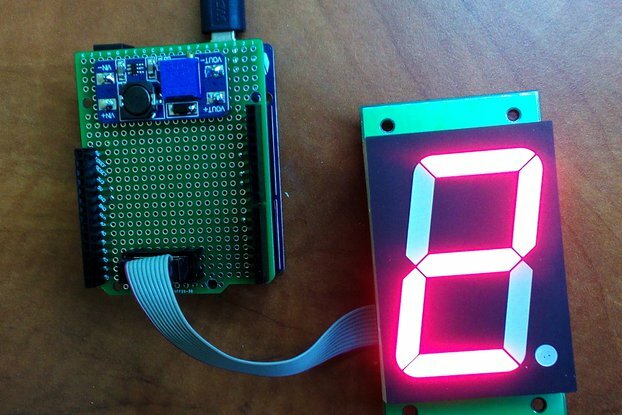 Chirp is Open Source Hardware available under CERN Hardware Licence v.1.1. Boards are produced and soldered by Elecrow in China, programming testing is done by the author. I ordered a few of these and liked them so much I ordered more. The seller stands by the devices and replaced one unit that I sent back to him because it was defective - he told me that he tests all the units and defective ones are rare. Communicating with the seller was quick and there were no language barriers. I've had no issues with the remaining devices, and they operate as expected. The only complaint I would make (if I had to make one) is that it takes a fair amount of time to receive the orders, but to be fair, I am in British Columbia, Canada, and these devices ship from Lithuania. I would gladly take the longer time rather over paying more for shipping, but be aware that it can take some time to receive these if you are in a hurry or need them in time for a gift. There's no documentation provided with the devices, but I would recommend printing the information from the device's website to keep for reference as it contains all the detailed information. you need there. I imagine I will be ordering more of these again in the future. Thanks so much for a great product and outstanding service. Not a lot to add. It works, is simple to use and well documented. I can only wonder why such a thing only exists as indie electronics. This is a way cool toy to 'annoy' friends. I bought a couple and have placed one in a plant at my friends place. She hates small animals like crickets. So that was fun when something is chirping in there house :P. But also, as she does not know yet, the plant needs water. Further, the hardware looks very good and solid. I have used other and, yes cheaper devices, but they are way worse compared to this. So spent a bit more money, but you will get better stuff and more fun! UPDATED: Catnip Electronics were quick to respond and send me a new unit. Very happy with their service. Having used my new Chirp for a couple of weeks, I am happy to report that it works perfectly. Accordingly, I have changed my product rating to 5 stars. I've tried to use the Chirp as described here - https://wemakethings.net/chirp/ - without any luck. The CR2032 fits very tightly on the Chirp, the fit is so tight actually that the battery is damaged (a small dent on the - side). After insertion of the battery the Chirp keeps on chirping instead of making two sounds as described in the the manual, and setting a new dry point does with the push button gives the same negative result. Have tested the Chirp on several plants, and it is quite clear that it does not work for me. Your unit might be faulty. Happens sometimes. Please PM me your order number, I will ship you a replacement! I'm travelling a lot and rent my place while away. And chirp is infinitely better then bugging people about watering my plants over emails, for everyone involved. Easy to use. Just pop-in a 2032 battery. Put in the soil, push the button and here you go. Plus it's smart enough to not wake you up. Yesterday was the second time Chirp reminded me to water the plants. I love how it chirps "Thank you!" once you've done it. Great value for money, this tiny system just works. Once you know how to get the battery in and have set the moisture level, you are good to go. I will order more of these for my other plants. Great work! It would be great if it had a plastic casing which can protect the electronic part with the battery. A small manual (if it is given as a present), is more than welcome. Using this product to help me remember to water the plants on my desk at work. The subtle occasional chirp is enough to annoy my co-workers into watering the damn plants even when I'm away just to shut that damn thing up. In summary, excellent idea, and both I bought have worked flawlessly. I ordered two for some frequently-forgotten plants along with two of the sensors (without chirp) to make Arduino automated watering systems. There is no indication which way to put the battery in, but if you're clever you should be able to get it figured out in two tries. After a day, one of them started a constant clicking noise. If this happens to you, it's because the battery is near death; replacing it made it work normally again. After using my first one for a few weeks I just ordered several more as gifts. Chirp is inexpensive and works reliably - just wait for your plant to reach the point where you'd water it, then push Chirp into the dirt and press the calibrate button. Next time the soil reaches that level of dryness you'll hear a chirp that repeats every few minutes. Chirp is smart enough to only chirp when the room is lit, so it won't drive you crazy at night. Water the plant and a distinct sound lets you know that the Chirp has reset itself and it's silent until next time you need to water. It's a very elegant approach. The only improvement I'd suggest is adding the battery type (CR2032) on the silkscreen. Right now you have to navigate to the support website (which is very thorough) to find out what type of battery to buy. The device ships from Lithuania, which adds a little time to the shipping, but wasn't expensive. I paid $7 in shipping to have 3 sent to the US, which took 2-3 weeks to arrive. Works really well standalone for plants that always want moisture, and I look forward to connecting them up to a bigger controller to manage dry periods for my cacti and succulents. Thanks for a well thought out sensor. So, I am very new to the world of Making and "hacking things", so when I saw that the Chirp! could address one of our needs (keep my wife's Orchid's alive!) 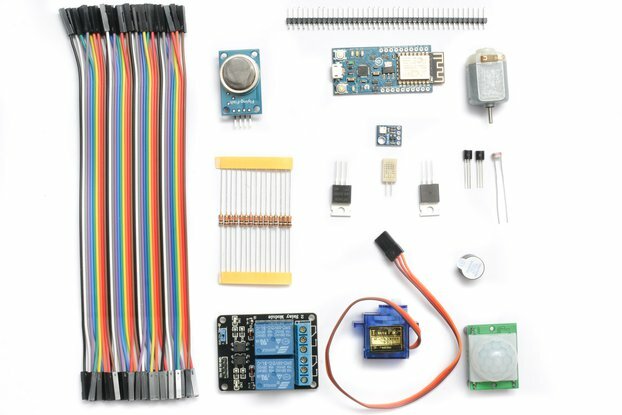 AND give me a chance to try out my Arduino with I2C for a small price - I jumped at the chance. This is a great little device and the option to use as a standalone Chirp! alarm, or turn into a sensor so easily (my very first I2C attempt on any hardware), is even better. Very pleased with the results (surprisingly efficient on battery use, nice work). Now I just need to understand the sensor data a little better for the plant. I plan on ordering more. This is a neat little gadget, just stick in the soil behind your plant, and it will beep when it needs watering. It's designed not to beep at night, so as not to disturb you. The device could benefit from a little minor tweaking, but it works well enough now, and the developer is friendly and responsive. Thanks for a nice review. What tweaking do you have in mind? So, my Chirp just arrived today, only 7 days later and I'm in the US and they ship from DE. Got really fast and friendly support on a question I had. Haven't put the device to use yet, will try to remember to update once I've used it a bit!